Photo provided by Wojciech Fedoruk. The Assumption Cathedral of the town-island of Sviyazhsk is a Russian-orthodox cathedral renowned for its complete 16th-century cycle of murals bearing symbolic meaning. The Cathedral dates from the period of Ivan the Terrible, when missionary posts for spreading Christianity in this originally Islamic Tatar region were established. 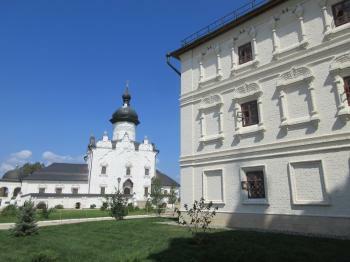 It is part of a homonymous Monastery. Visited Sviyazhsk in August 2017 just 1 day before Irina Bokova also visited this site in order to personally hand over UNESCO certificate. For this occasion on the road from Kazan airport there were celebrative flags and posters. We visited Sviyazhsk as half-day tour on car from Kazan. The place is now extremely touristy and visited by the group hoards. This legendary city was founded in 1551 by Ivan the Terrible as an outpost to attack and capture Kazan. The wooden Kremlin was constructed in 4 weeks with the wood transported 700 km through river from Uglich. In 1 year Kazan was seized and included into the growing Moscovite kingdom. Sviyazhsk became quite big military base and city. In 1918 Sviyazhsk became famous again when Leon Trotsky personally headed Red army in its fight against the White Guard ruling in Kazan. In this dark period, he ordered to death each tenth soldier from the corps that earlier surrendered Kazan (punishment used only during Roman Empire times). In 1957 after construction of Kuibyshev reservoir Sviyazhsk became an island. Only in 2008 a road dumb was completing facilitating access to the site. Starting from 2000s massive restoration and reconstruction program was initiated by Tatarstan authorities and WHS application after several years finally succeeded in 2017 (but narrowing to the Assumption Cathedral and Monastery only). The island is a place for pleasant walk with many restored churches and well maintained civil buildings. Apart from the Assumption Cathedral, the main attraction is another monastery with wooden Trinity church dating back to 16th century. Unfortunately the Assumption Cathedral was closed due to restoration works (and preparations for I.Bokova visit), but it is possible to walk around the monastery compound, which in overall looks very pleasant. The Cathedral was built by Postnik Yakovlev, one of the authors of St. Basil Cathedral in Moscow. Museum of civil war (assumed place where Leon Trotsky stayed during his days in Sviyazhsk) is also worth visiting. In overall, I liked the overall impression of the site, and will be planning to come back when the Cathedral frescos are open for the visit. About 60 km from Kazan, on the opposite side of Volga river, lays small but beautiful town of Sviyazhsk. The town was built by tsar Ivan the Terrible in order to have a good starting point to invade Kazan Khanate. He built there numerous tserkvas, nunnery and of course a stronghold. In that time Sviyazhsk was one of the most important towns in the Moscow Tsardom. But the successful ride on Kazan in 1552 was the end of Sviyazhsk’s golden years. Kazan, although thoroughly destroyed, soon became the real capital of that region. Sviyazhsk only sustained his status of a regional centre of Orthodox faith. Really dark years came to Sviyazhsk with the October Revolution. First Leon Trotsky came to the town and among the numerous tserkvas ordered to built the statue of the first revolutionist - Judas Iscariot (what a sense of humour the bolsheviks had!). But then Stalin was not joking by expelling monks, destroying many tserkvas and building a GULAG, which functioned in Sviyazhsk for about 20 years. In WWII out of 400 people from Sviyazhsk (populated 1300 in total) only 2 came back. After Stalin's death the camp was changed into a closed hospital for mentally disabled. In the meantime, after creating Kuibyshev water reservoir, Sviyazhsk became an island. Better times came around 2000, when the federal and regional authorities started to rebuild and reopen Sviyazhsk for visitors. Monks came back, some tserkvas were rebuilt and in 2008 eventually a causeway was constructed, making this site a peninsula again, much easier to visit by tourists. Sviyazhsk is a very nice and interesting place, a must-see for tourists visiting Tatarstan. Even the overall view of the town with its walls and towers over the Volga river makes the trip worthwhile. Although the reconstruction works are not finished, many buildings are open for visitors. The most interesting is Assumption Monastery from XVIth century (its main church, Assumption Cathedral has original XVIth-century frescoes and finally was the only property inscribed on the list). Another one is St. John the Baptist Monastery with old wooden church from the middle of XVIth century. The church has one of the few paintings of young tsar Ivan the Terrible. There are numerous ways of transport from Kazan to Sviyazhsk. The most popular is by a speed boat, but the tickets during summer season have to be booked about 3-4 days in advance. There are also numerous trains (the journey takes 1- 1.5h only) but the station is about 10 km from the town and I am not sure of the transport there. There are also organized tours, lasting for about 6 hours. I choose this option (I was lucky, as I took last place in 52-people bus). I was very happy with the tour, it gave me lots of information that I could not get being an individual visitor. There are also tours in English, but I suggest contacting local agents in advance.